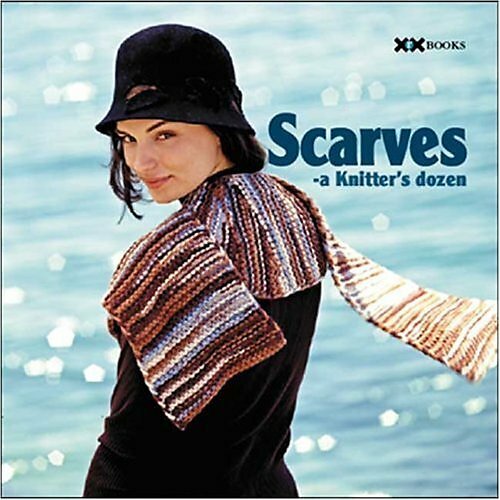 Pattern consists of 4 scarves (A, B, C, D). 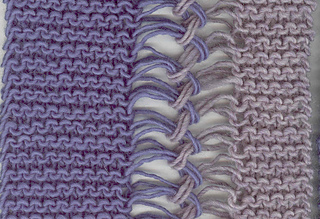 Each scarf is made of strips that are connected with loops made from dropped stitches. These loops can be connected by using a crochet hook or your fingers. SCARF A: 285 yds, double-stranded light weight yarn. Guage with smaller needle over Garter Stitch is 18 sts, 20 rows in 4”. Finished size: 5”x48”. SCARF B: 125 yds, bulky weight yarn. Guage with larger needle over Garter Stitch is 16 sts, 18 rows in 4”. Finished size: 58”. SCARF C: 140 yds MC and 70 yds CC, medium weight yarn. Guage with larger needle over Garter Stitch is 18 sts, 22 rows in 4”. Finished size: 6”x72”. SCARF D: 175 yds, medium weight yarn. Guage with larger needle over Seed Stitch is 15 sts, 15 rows over 4”. Finished size: 6”x72”.